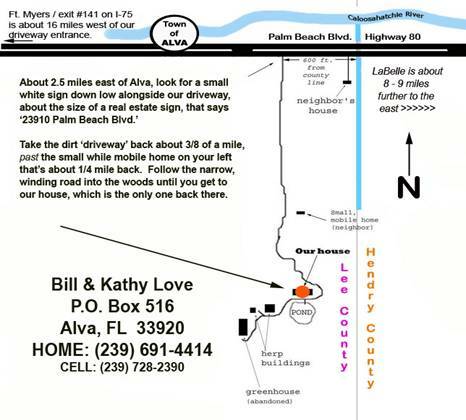 The annual Calusa Herp Fest Christmas Party will be held at the home of Bill & Kathy love (in northeastern Lee County - see map below) starting about 1:00 pm. If you'd like to help with preparations (hint – hint), c'mon over more like noonish. CALL if you get lost - (239) 691-4414. We’ll have signs with balloons on the highway to help lead you in. The club is providing the main grilled / barbeque foods & soft drinks + utensils, plates, napkins, etc. You're invited to bring a side dish or dessert, and whatever liquid you care to consume and share if it’s other than the assortment of soda and bottled water the club will provide. Besides the usual camaraderie, there'll be live music (by whichever of our musically-talented members bring their instruments, a pool to swim in, horseshoes, a pond to fish in, and turtle races – Chris Lechowicz will have his racing turtles (captive bred or long-term captive turtles only, no recent wild collected turtles are allowed) harnessed and ready to run, plus you’re welcome to bring your own land or water turtle speedsters (with holding tubs). There'll be a "Herp Stuff Auction" around 5:00 pm. There's not any particular cut-off time tonight, so plan on hanging out as long as you please. 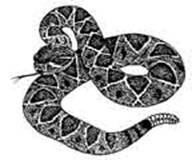 To raise money for the club, we are asking all attendees to bring something as a donation for the big "Herp Stuff Auction". It can be a live healthy herp, a herp book, a handling tool, a piece of artwork, almost anything that relates to herps or herping! Please attach a note with your name to it so we can thank you when we announce the item for bidding. And, bring lotsa money to bid on stuff --- this is our biggest fund-raising event of the year!